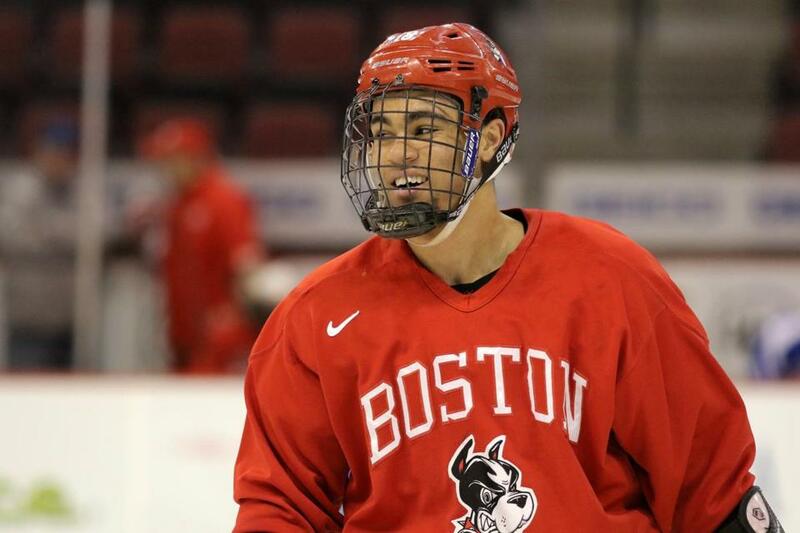 As per Jonathan Sigal of The Boston Hockey Blog, Jordan Greenway has decided to return for his junior year at BU. The 6'5" winger and 2015 Minnesota Wild second round draft pick played 37 games during his sophomore season and had a 10-21-31 scoring line. Over the past several weeks, the Terriers have had to deal with the early departures of top-six forwards Clayton Keller and Jakob Forsbacka Karlsson, as well as top-scoring defenseman Charlie McAvoy. So, the return of top-six forwards and rising juniors Greenway and Bobo Carpenter will be a boon to the Terrier offense and create additional leadership for another large and talented freshman class this coming fall. As the first round of the 2016-2017 NHL Stanley Cup playoffs began last night, and continue to begin this evening, all eight series have at least one player and/or coaching staff member who are former Boston University Terriers. Players include Adam Clendening of the NY Rangers, Nick Bonino of the Pittsburgh Penguins, Kevin Shattenkirk of the Washington Capitals, Jakob Forsbacka Karlsson and Charlie McAvoy of the Boston Bruins, Alex Chiasson of the Calgary Flames, Charlie Coyle of the Minnesota Wild, Eric Gryba of the Edmonton Oilers, and Colin Wilson (out for the first game due to a lower body injury) of the Nashville Predators. Coaches include Pittsburgh head coach Mike Sullivan and Boston assistant coaches Jay Pandolfo and Joe Sacco. Former Terrier Nick Bonino scored his first playoff goal (of this season) as the Pittsburgh Penguins shut out the Columbus Blue Jackets Wednesday night, by a score of 3-0. Former Terrier Kevin Shattenkirk assisted on the first of three Washington goals, as his Capitals defeated the Maple Leafs in overtime, 3-2, on Thursday night. ● CSNNE.com An "Amazing Experience"
Former Terrier Danny O'Regan won the 2016-2017 Dudley (Red) Garrett Memorial Award, given to the American Hockey League's most outstanding rookie. In 61 AHL games, the Needham, Massachusetts native has a 22-34-56 scoring line for the San Jose Barracuda. He was recalled by the Sharks last Sunday for their regular season finale and scored his first NHL goal. With the 2017 NHL Entry Draft only ten weeks away, NHL Central Scouting Services has released its final rankings, and the Terriers are well represented, with one current goalie and six future skaters: Jake Oettinger was ranked #1 among all North American goalies. Six Terrier recruits also made the list for North American skaters: They include 2017 recruits Shane Bowers (ranked 16th, forward, currently playing with Waterloo of the USHL), David Farrance (ranked 46th, defenseman, currently playing for the US NTDP of the USHL), Cameron Crotty (ranked 89th, defenseman, currently playing for Brockville of the CCHL, though Crotty may arrive at BU in 2018), Kasper Kotkansalo (ranked 92nd, defenseman, currently playing for Sioux Falls of the USHL), Logan Cockerill (ranked 214th, defenseman, currently playing for the US NTDP of the USHL) and 2018 recruit Ryan O'Connell (ranked 208th, defenseman, currently playing for Saint Andrew's College of the USHS). Thanks to several Terrier recruits, Team USA is off to an excellent start at the 2017 International Ice Hockey Federation Under-18 Men's World Championships in Slovakia. On Monday, Team USA defeated Finland in an exhibition game. 2017 recruit Brady Tkachuk scored two goals and was assisted on his first by fellow classmate David Farrance. That goal tied the game at one apiece. After the Americans took the lead, 2019 recruit Joel Farabee provided an assist on an insurance goal. The final score was 5-2. This afternoon Team USA walloped Belarus 7-0 in the opening game of the preliminary round. Farrance scored a goal, while Farabee and Tkachuk had two assists and one assist, respectively. The next game for Team USA will be against Russia on Saturday at 3:30 Eastern Time. That game will be carried on the NHL Network.